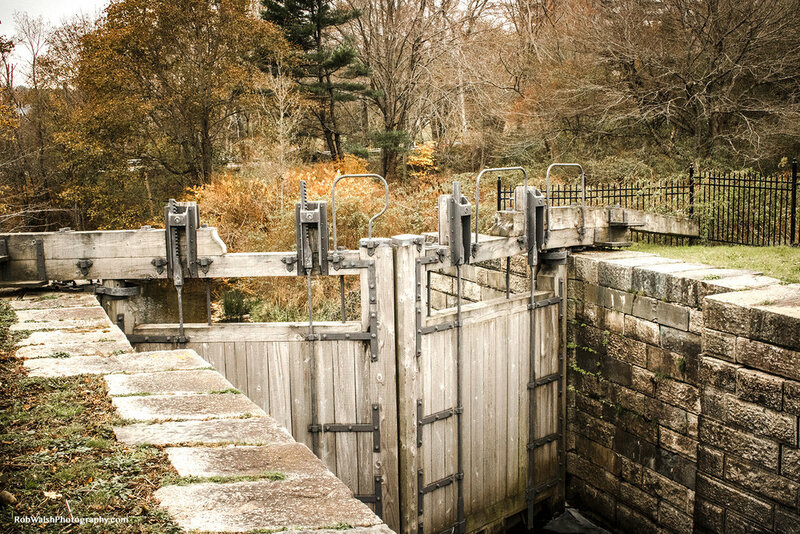 A lock is a short, confined, and watertight chamber, or section of a canal, in which the water level can be changed by the use of gates and sluices so vessels can be lowered or raised between two gates and travel either upstream or downstream on the canal. It is believed that the first canal locks were built by the Chinese sometime in the tenth century AD, and were later modified by Leonardo da Vinci’s v-shaped miter lock that created stronger walls to hold against more water pressure. This design can still be found in most canals and waterways today. By the nineteenth century, locks were simple to operate but were complicated to build. Valves and gates had to function easily while not allowing too much water through. Lock walls and gates had to be strong and large enough to withstand the water pressure exerted upon them by tonnes of water. Locks made the Shubenacadie Canal easy to navigate for smaller sailing and steam vessels and barges carrying goods. The nineteenth century locks of the Shubenacadie Canal Waterway are very unique. From Halifax Harbour, to Lake Charles, you can see a variety of engineer building styles and how these locks changed over time. Locks 1, 2 and 3, are the best examples and show the different styles used between the original British construction period of 1826-1831, and the canal’s completion as a Marine Railway in 1861 in the American building style. 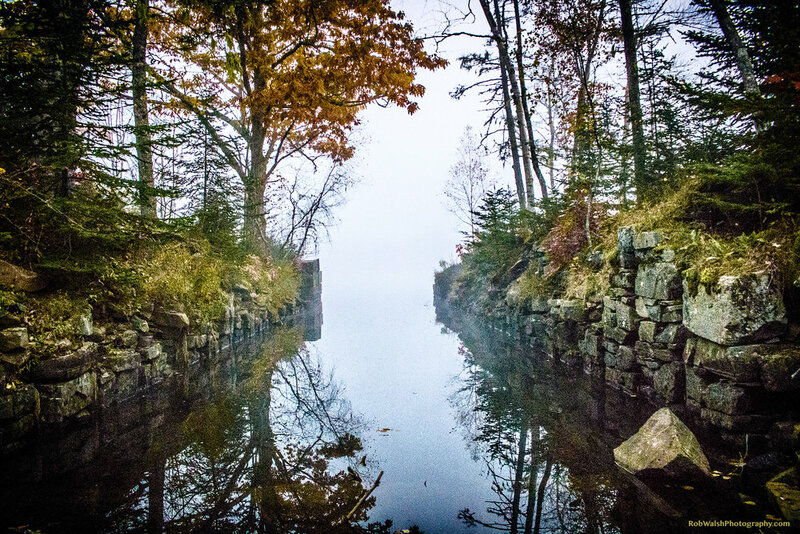 The original 1820s stone lock located underneath the Shubenacadie Canal Marine Railway in Dartmouth is an excellent example of how the original and newer canal structures worked together. When the Mi’kmaq people were the sole users of the waterway there was no flow of water between Lakes Charles and Micmac, a distance of approximately 1500 m. It was only this section of the system which required a major portage. Archaeologists have found the remains of camp sites at both ends of this corridor suggesting these were favored overnight stops. It is interesting to note that the bark canoe which was in common use among the aboriginals was not known to the Europeans who were accustomed to using dug out craft which were much heavier. It was Champlain who pointed out it would not have been possible for the Europeans to explore North America without the use of the bark covered canoe. It was the birch bark canoe which enabled the Mi’kmaq to spend summers on the coast and winters inland. The first section of the channel between Lake Micmac and the bridge below the Ball Field involved the removal of earth. However to complete the water course from this location to the shore of Lake Charles required the removal of solid bedrock and this was considered to be the most difficult section of the entire waterway. It is fortunate that so little disturbance has occurred since this work was done and thus visitors are able see the channel as well as the piles of rock just as they were left 180 years ago. About midway along this section of the Cut a sign can be found marking the location and remains of the Blacksmith’s Worksite. While only a few stones remain, at the end of the Cut at the edge of Lake Charles there was a Control Gate which served to maintain the desired water level of the Lake. Due to the lack of transportation it was much simpler for the Canal workers to live close to their work sites. There were two key communities on the Atlantic side of the Canal. The larger of these was at the south end of the Cut between Lakes Micmac and Charles and the second was between Sullivans Pond and Christs Church on Octerloney St. It is very fortunate that so little disturbance has occurred in the Shubie Park area – visitors are able to view a number of foundations which have not been significantly disturbed since they were vacated over 175 years ago. So that while logs, bark and branches may have rotted, the stone foundations of a number of the homes can still be seen. As well as the dwellings the remains of a workshop and blacksmiths forge have also been located. In the Fairbanks Centre there are several displays of objects found at these sites. The area between Sullivan’s Pond and Halifax Harbour was the site of a Marine Railway when the Canal operated between 1861 and 1871. During that time barges on a wooden boat cradle were pulled up the slope to the Pond. The equipment in the flume house controlled the flow of water from the wooden flume as well as the cable attached to the cradle. Life-size replicas of each of these features – the boat cradle, flume house and flume are currently on site at the Canal Greenway.